After building a road, Lisa says she feels "like Robert Moses in that giant book that took me two years to read." She is probably referring to The Power Broker, which has 1,336 pages. When talking about planting trees to deal with their carbon footprint, Lisa says "the Inconvenient Truth is this place looks dull", a reference to Al Gore's An Inconvenient Truth. When you level up to level 5, Barney says "It's always level 5 somewhere". This is a reference to the Alan Jackson song "It's Five O'Clock Somewhere". The username JoshJeerer, Lamezino and SpAndex for the season 25 update is a references to the user, JoshSherer, Gamezino and spAnser. Homer's animation when he's dealing with ghosts in the Treehouse of Horror XXIV event shows him gobbling donuts lined up in a row in front of him, then when he eats a large one, he grows and swallows a ghost. This is a reference to Pac-Man. Akira calls Comic Book Guy a "kaiju", the Japanese word for giant monster (i.e. Godzilla, Gamera and Rodan). In the game, characters break the fourth wall frequently. Homer suggest he and Lisa move to Miami instead of rebuilding Springfield. There are four cutscenes in the video game, that were uploaded to YouTube on March 11, 2012. The first cutscene is shown when you play the game for the first time. 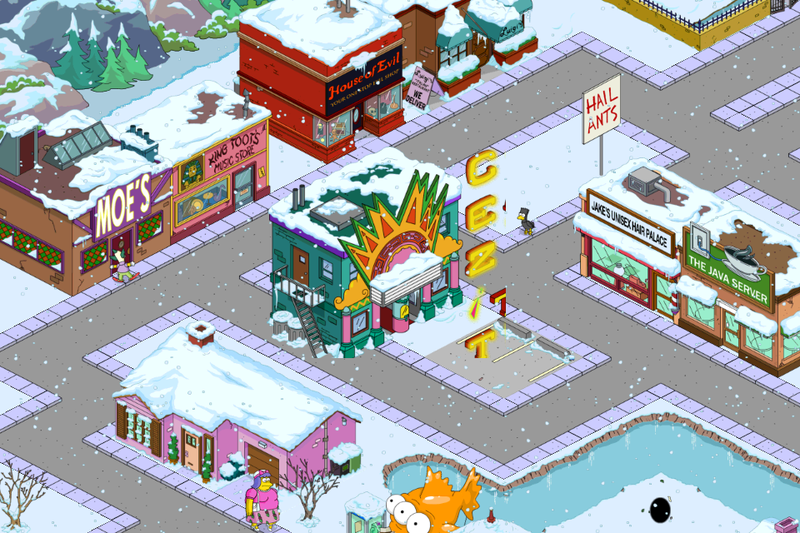 The second cutscene is shown once Homer completes his first shift at the Power Plant, the third cutscene is shown once the player has bought Bart's treehouse, and the fourth cutscene is shown once the player has built Moe's Tavern. You can steal a lemon tree from one of your friend's Springfield, and if you plant it in your town within 24 hours, it will start to generate XP and cash. But when your friend visits your Springfield, they can steal it back. Recently, EA disabled this functionality from the game. You start off the game with $750. If you make Principal Skinner be a crossing guard and your Springfield Elementary School isn't near a road, he will stand outside the school anyway. Sometimes, characters may walk over water to get where they are going if there is no other way there. In the German version McBain's task "Battle Commie Nazis" is translated to "Fighting the terrorists"
The clocks in the game shows different times. There is a patch of oil on the Simpson House driveway and the Control Building parking lot, showing where Homer parks his car. 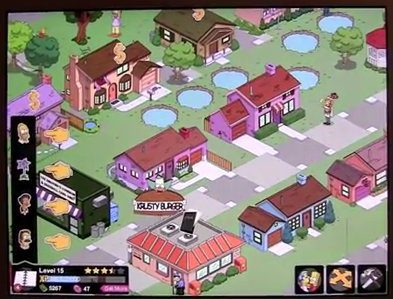 It's possible for people to have two Milhouses, the first is the unlockable character and the second is seen inside Lumpy alongside Lewis Clark and Richard. A character group was introduced in the 'Wild West' event that included all of Agnes Skinner's past boyfriends, said list was created with information from Simpsons Wiki. 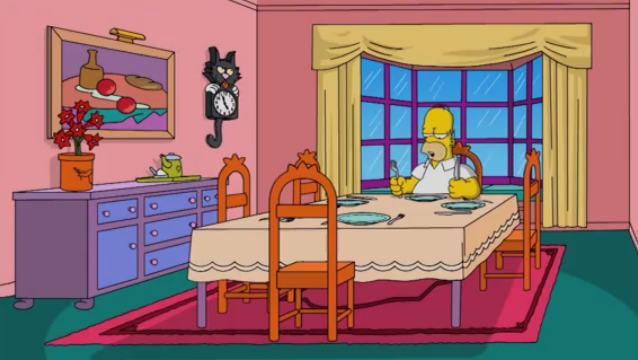 In the trailer, the Simpson's house only shows Homer inside and the space around him would be too small to fit their whole house in. In the opening intro, the tire fire isn't on fire. However, the fire could have been put out. Lisa mentions that she and Milhouse are both eight-years-old. Milhouse is in fact ten-years-old. Hans Moleman mentions that he is 23. He is actually 31. "Worldwide News" is misspelled as "Wordwide News" in the list of Channel 6 programs. Ned Flanders is right handed when he is "Santa Flanders". In the War of Art update dialog, Janey's name is misspelt as "Janie". In the Superhero event, The Collector's lightsaber has green blades when they should be red. There are more glitches in the game than there are in this list. If a glitch is not frequent enough, it will NOT be added to this list. Houses and buildings in the game are somehow placed 'outside the land', and when you click to buy a land expansion, the land in which the buildings are on show up with a price. On March 1, 2012, the response to Tapped Out was so overwhelming that it created some connection issues. On March 3, 2012, EA were still working to fix the issues. On the evening of March 3, the game was removed from the App Store, although players who downloaded Tapped Out before March 3 could still play the game. On March 8, it was announced that most connectivity problems had been fixed, but are working on a solution to player's characters or buildings that have disappeared. Since March 9, no updates have been made on the game's Facebook page, no updates from EA, apart from a post on the EA Game forums in April which showed an email reply from EA, saying that the company was STILL trying to fix the bugs. On March 11, 2012, reports began of an error with player's Origin accounts. The error somehow made multiple Springfield's on the user account, and in some cases, supposedly made the game wipe all the player's progress, and when they log in again afterwards, goes back to the player's former Springfield which progress was supposedly wiped. Since the launch of the Tapped Out forum, users have been reporting problems which appear to be the "DC while loading friends city bug". Not technically a glitch, but since EA have released different versions of Tapped Out in different countries, if players add a friend who is playing on a different version of Tapped Out, they cannot visit them. EA said that once they re-release the app, they will standardize versions across countries so people on different versions to each other can visit each others towns. A common error in the game is that after visiting a friend's town, they find that their town has been messed up. Then, when they attempt to log in the next time, the game crashes. Sometimes, texture glitches appear in the game. That is when another building/object appears instead of another building. For example, Moe's Tavern may appear where a Blue House should be. The town in this picture has pavements and roads in wrong places. If the player runs the game on his/hers jailbroken iPhone/iPad with backgrounder setting and changes the date, the game will move forward, enabling them to keep on moving time to get the mystery box. 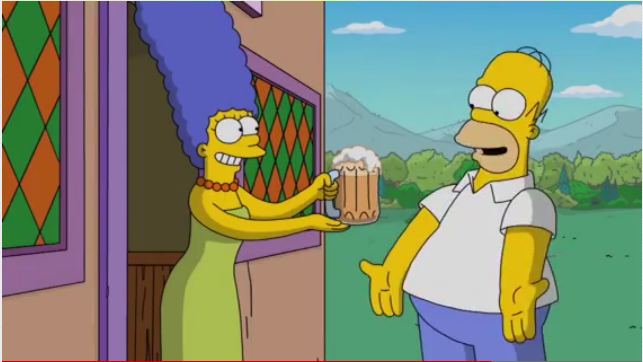 Homer's quote "One time our house was next to a prison so I could make a joke about how we lived next to a prison." references how in "Pokey Mom", Marge looks out the window in one scene and sees the Waterville Prison a few fields away from 742 Evergreen Terrace. One of Moe's jobs is to smuggle endangered species. He then runs to his tavern with a panda on his back, a reference to "Cape Feare". 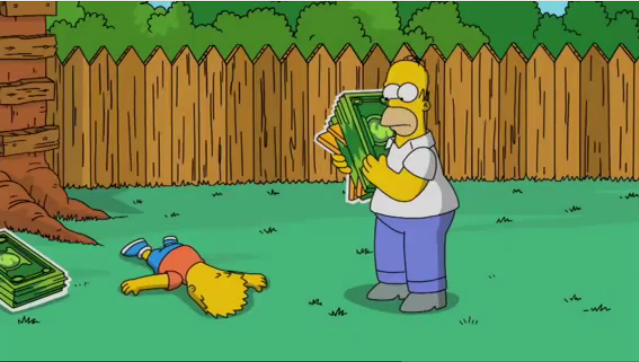 The "Death by Squishee" quest is probably a reference to "Boy-Scoutz 'n the Hood" where Bart and Milhouse take an all-syrup Squishee. In "Illegitimate Concern Pt. 1" there are references to the teachers strike from the episode "The PTA Disbands" with Bart saying that Skinner will "fold faster than Superman on laundry day." Frank Grimes from "Homer's Enemy". Shary Bobbins from "Simpsoncalifragilisticexpiala(Annoyed Grunt)cious". Red Barclay from "Maximum Homerdrive". During the "2015 Halloween update" Selma and Barney are mentioned to have hooked up during "Grown-up Halloween" (from "Halloween of Horror"), Selma and Barney previously dated in "Principal Charming". A character group introduced in the 'Wild West' update is comprised of Agnes Skinner's past relationships. Modified on June 3, 2018, at 13:20.